This breed is also one of the laziest couch potatoes you’ll ever find. Because of their short fur, they love all things warm and will cuddle up wherever they can find a squishy, soft place to lie. Maybe that’s why this canine is categorized in the Toy Group. They are companion dogs at heart and make great cuddle buddies. The Italian Greyhound is truly an ancient breed. He is thought to have originated over 2,000 years ago in what is now Turkey and Greece. Because the breed is so old, we have no record of what the Iggy’s original purpose was. But he is thought to have served as a hunter in addition to being a companion. With time, the breed spread throughout Europe. Then in the 16th century, it became popular among Italian royalty, hence the breed’s name. During this time, there was a high demand for small lap dogs, and the Iggy became a mark of status. Breeders tried for smaller and smaller versions of the Iggy to meet this demand. But poor breeding practices only led to mutated and deformed dogs, and the breed was almost destroyed. Luckily, a group of Iggy-lovers came together at the end of the 1800’s to restore the breed to normal. It was around this same time period that Italian Greyhounds came to the United States. In fact, the American population of Iggies helped save the breed from extinction, as they were later used to help restore the breed in Europe. Are Italian Greyhounds Good Family Dogs? Unfortunately, Italian Greyhounds are not the best choice when it comes to finding the perfect family dog. This isn’t due to a sour temperament. Quite to the contrary, Iggies are sweet and affectionate. But because of their tiny, delicate build, Italian Greyhounds are not recommended for families with children under ten years of age. They typically don’t tolerate a young child’s rough play. And they can easily get hurt due to their small size. The Iggy is a companion dog. He thrives on being with his people. So if you need to leave your dog home by himself for long periods of time, the Iggy probably isn’t a good match for you. On the other hand, if somebody is home a lot of the time and you don’t have small children, the Iggy could make the perfect companion! If you do have a home befitting to an Italian Greyhound and you properly care for him, your Iggy will make a fantastic pet. As with all dogs, the Italian Greyhound has a few basic needs that you’ll have to provide for, including nutrition, grooming, exercise, training, and health. Like all breeds, Italian Greyhounds require a balanced diet. They also need an owner that understands their body structure. Because the breed is naturally thin, people may tell you that you’re not feeding your Iggy enough or that your dog is too skinny. Of course it is possible to have an underweight Iggy. But more often than not, Italian Greyhounds tend to be overweight due to misconceptions about their body structure. On a healthy IG, you should be able to see a distinct waist. You should also be able to see traces of his bottom three ribs when he is in a resting position. If this isn’t the case, your pooch is probably overweight. On the other hand, if you can see a majority of the rib cage, your Iggy likely needs to be fed more. When feeding, give your Italian Greyhound only high-quality dog food, and be sure to measure out meal portions. The amount you should feed depends a lot on size, age, and activity level. But in general, Iggies should eat ½ to ¾ cup of dry food daily. The breed should be fed twice a day, with the proper amount being divided into two meals. And remember, if you give your dog a few more treats than usual on any given day, be sure to adjust his meal portion accordingly. You don’t want to overfeed. For further reference on feeding, check out the guide listed on your dog’s food bag. You may also want to talk to your veterinarian about exactly how much your individual dog should be eating. Italian Greyhounds are a low-maintenance breed when it comes to grooming. Because the coat is short and sleek, you only need to brush your Iggy when he gets dusty. Even a quick wipe down with a damp cloth will suffice. Though they do shed, Italian Greyhound shedding is minimal. You may not even notice because their hairs are so fine. In fact, Italian Greyhounds are one of the few hypoallergenic breeds that doesn’t have a high-maintenance coat. In addition to regular wipe-downs and baths, you’ll need to do a few more things to ensure your Iggy stays healthy. But they don’t require too much effort, either. Italian Greyhounds are prone to dental problems, so you’ll need to brush your dog’s teeth a few times a week. (Though daily is better.) Also plan on regular dental cleanings from the vet. Besides that, trim your Iggy’s nails once or twice a month. And check his ears for redness or a bad odor, as these could be signs of an infection. If you’ve heard of the “zoomies”, then this is definitely a breed that gets them. He may love snuggling in warm blankets, but in between his naps, the Iggy will suddenly explode into a burst of speed. And that saying “bouncing off the walls”? Well, he’ll turn that saying into complete reality. Since the dog tends to have sudden fits of sprinting, it’s best to have a fenced yard. Unless you want a little dog tearing around your house at lightning speed every so often. While he may be small, the Italian Greyhound is agile and is an excellent jumper. You will need at least a six-foot fence if you hope to contain him. 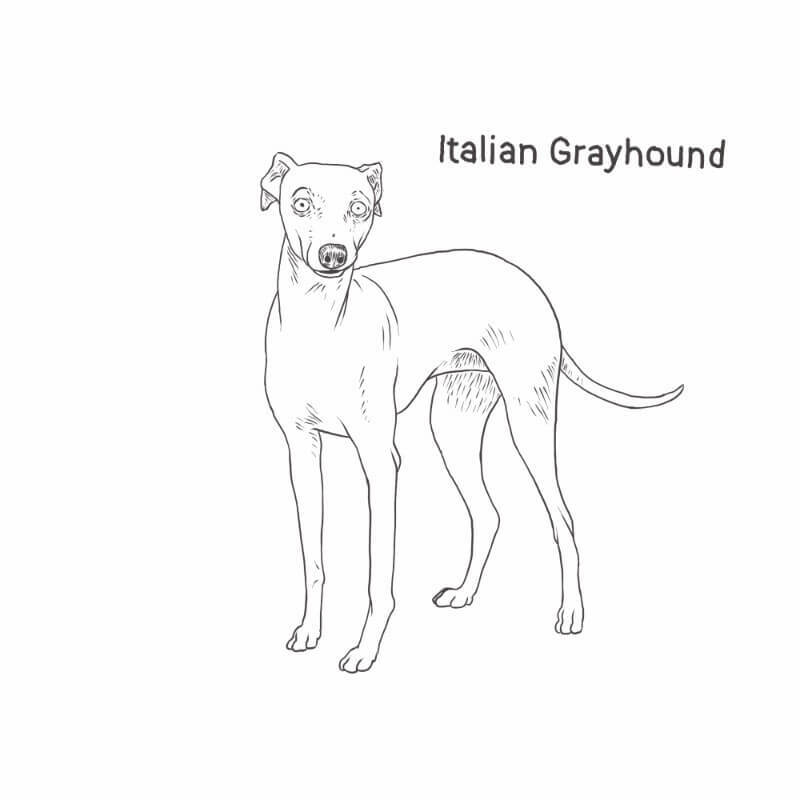 Though Italian Greyhounds like to run, you don’t have to be a runner to own the breed. They are fast, but they aren’t built for distance running. All an Iggy needs is a few sprints around the yard or a dog park. Then they’ll be good on running for the day. Other than that, a daily walk will be more than enough to keep your Italian Greyhound well-exercised and happy. The Italian Greyhound is an intelligent breed that can easily be trained with the right approach. Never attempt to train your Iggy with harsh punishments, as they are a sensitive breed. Instead, use positive reinforcement training. In other words, reward your dog with treats, toys or other praise for good behavior. The breed tends to have a “What’s in it for me?” mindset when it comes to training, so keep those rewards coming! Also, plan on several short training sessions, rather than big long ones. The “hound” part of an Italian Greyhound makes for a short attention span. Because they are a generally well-behaved and docile dog, training should not be too difficult, even for first time dog owners. Just remember, consistency, praise, and treats will go a long way when working with an Iggy. The one problem that you may run into when it comes to training an Italian Greyhound is housebreaking. Even with consistency and patience, you may never fully house train your Iggy. Housetraining issues are the number one reason Italian Greyhounds end up in shelters. So if you’re considering getting one, be prepared to face the possibility that your Iggy may never be fully housebroken. Italian Greyhounds are surprisingly healthy and sturdy dogs considering their fragile appearance. We’ve already talked about the Iggy’s exercise needs (and about his love for the zoomies). But all in all, the Italian Greyhound would much rather curl up in sunlit pile of blankets than run a race. It’s ironic, but this top-speed dog isn’t always up for top-speed running. Make sure to exercise your IG, of course. (All dogs need that!) But don’t be surprised if he seems a little lazier than what you’d expected. He’s a unique athlete that loves napping more than working out! The Italian Greyhound is a lot sturdier than you might give him credit for. But, all the same, he does have fairly thin, fragile legs. If you’re thinking of getting an Italian Greyhound, just go ahead and set some money aside now for a potential broken leg down the road. This is especially true if you’re getting an Iggy under two years old, as this is the age range when he is most likely to break a bone. You can try to avoid problems by keeping an eye on your pup. Try not to let him jump off of tall things, especially while he is still young. But unless you’re able to monitor him 24/7, I would again recommend being prepared for the worst case scenario (i.e. an expensive vet bill and a limping pup). Italian Greyhounds live for their cozy comforts. And if it’s raining or snowing or otherwise miserable outside, they will not want to leave their warm couch when duty calls. Wet, mucky weather is one reason an IG might do their business indoors. Another reason is they’re simply not willing to wait. If an Italian Greyhound has got to go, and you’re not paying attention, be prepared to find a puddle or pile of something unpleasant later on. This may seem repetitive, as I’ve already warned you that the breed is difficult to housebreak. But I just want to make sure you’re 100% aware of this potential Iggy issue. If a bit of pee and poo doesn’t bother you too much, then that’s great! But if you are the type of person who can’t stand to have a dog having accidents in the house, then an Iggy probably isn’t right for you. Please keep this in mind when looking for your fur-iend. We don’t want more pups ending up in the shelter. First, the issue of weather. You may be able to encourage your Italian Greyhound to use the bathroom outside in bad weather if you provide a covered area. A personalized doggy potty spot on a covered porch or patio would do the trick. Or possibly potty pads in the garage. And throw a sweater on your pup for good measure. The breed doesn’t handle the cold very well. At all. Second, consider getting a doggy door. If your pooch has constant access to a nice covered area outside, he’s much less likely to go in the house. If a dog door is not possible, then make sure you are responsive when your Iggy signals that he needs to go. This is not a dog that can “hold on a sec and then I’ll let you out.” If he’s gotta go, you better run to open that door because he’s not going to wait for you. Italian Greyhounds do love to sprint around, and having a yard to facilitate that desire is definitely a plus. But if you live in an apartment and still want an Iggy, you’re in luck. Iggies do well in small living spaces. They’ll probably get the occasional bout of zoomies, but all in all, they are good candidates for apartment living. Just make sure they get a daily walk! Italian Greyhounds enjoy canine company. They do fine as an only dog, but chances are they’ll be much happier with a four-legged friend of their own. This is something especially good to consider if your Iggy has separation anxiety. Having a doggy-friend while you’re away can make your absences less stressful for your pooch. If you do get a second dog as company for your Italian Greyhound, be sure to get something comparable in size. A bigger dog can accidentally hurt an Iggy during play, so you’ll definitely want to avoid that. Italian Greyhounds are huge people dogs. But they tend to stick to the people they know. With their owners, Iggies are extremely loving. They soak up all the attention and affection they can. Then they give it all right back to you in return! In fact, the Iggy tends to be a Velcro dog, never wanting to leave your side. Italian Greyhounds are very polite with strangers as well, but the breed can be a bit aloof. It is also possible to have a shy, timid Iggy. To avoid this, you’ll want to be sure to socialize the breed from early on. Help your pup meet all sorts of people and dogs from a young age so that you don’t end up with a fearful adult. Italian Greyhounds are excellent hunting dogs. But unlike your typical canine hunter, the Iggy doesn’t use his nose to find what he’s looking for. Instead, he uses his keen eyesight and speed. Yep, you said it. But there’s something to learn from this little fun fact. The Iggy doesn’t aimlessly wander around following his nose. If he sees something, he’s going to be bolting after it before I even finish this sentence. So don’t take your chances. Keep your Iggy on a leash unless you want to end up with a lost dog and a dead rabbit. Walking your Iggy on a leash is clearly a must. But this breed requires a little something more than your typical leash and collar combo. If not, you should find out a bit more about them before getting an Italian Greyhound. As a quick overview, a Martingale collar is designed to keep your pup from wriggling away. Because an Iggy’s skull is smaller than the base of his neck, a traditional collar will slip right off without much effort. This is why a special kind of collar is needed. That being said, don’t skip on a traditional collar. Martingale collars are important for walks, but they aren’t safe for your Iggy to wear unsupervised. So stick with a traditional collar to hold your Iggy’s ID tags and only use the special one for walking on a leash. Italian Greyhounds make fantastic watch dogs. They are usually quick to alert to unfamiliar noises, so you’ll know when someone comes up to the door or pulls into the driveway. The breed isn’t aggressive, though. As I said before, they are aloof with and sometimes even fearful of strangers. So you’ll get an alert-bark, but once the new person actually appears, your Iggy is likely to run away. Once again, don’t be fooled by this speedy dog. The Italian Greyhound loves the occasional sprint and needs exercise like any other canine. But this dog was not designed to live outside on his own for a number of reasons. First, he craves love and attention from his people. He will always want to be with you. Second, he needs his cushions and carpets and comfy blankets. This dog loves to be warm and will seek out any and all places where he can snuggle up. And a towel thrown into a dog house in the backyard won’t cut it. He needs to be inside with you. Speaking of being warm, please put a sweater on your dog before walking him if it’s chilly outside! Some people may not like the idea of dressing up a dog. But with this breed, it isn’t for looks; it’s absolutely necessary. That soft, sleek Iggy fur feels amazing to the touch. But it doesn’t do much to keep your dog warm. So do him a favor and invest in a nice dog jacket for chilly days. I know it sounds silly, but be careful not to sit on your Iggy! Buried deep in your bed. Wedged into your couch cushions. You name it. But if it’s something soft and comfy around your home, it’s free game for an Italian Greyhound. So be sure to look before you sit so you don’t squish your poor guy! 12. What Are My Color Options? These colors can be solid or they can be combined with white markings. The AKC accepts all of these variations. In addition, you may come across two other color varieties. One is black and tan, and the other is brindle. While these markings also make for a beautiful dog, these Iggies cannot be shown according to the AKC. If you’re like me and you hate decision-making, you probably want a yes/no answer to the above question. But I’m sorry to say…only you can make that call! As with any breed, if you have the right lifestyle, and you’d love to own one, then an Italian Greyhound is probably the perfect match. Just be sure you consider all the pros and cons. And be honest with yourself when you wonder if an Iggy is right for you!